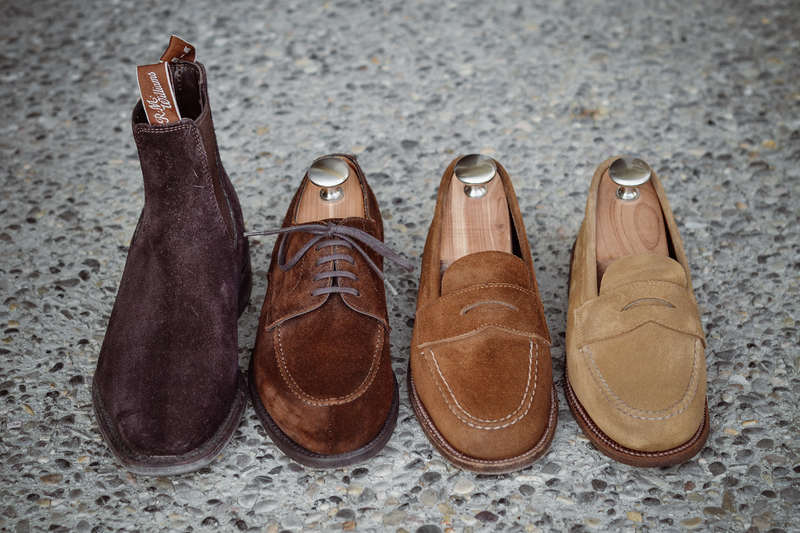 Let me start off by saying that I have a longstanding love for the Edward Green Dover, owning two pairs and always wanting to add more to my collection. However, budget wise I have been focusing on other areas of my wardrobe and footwear has been taking a backseat to sport coats. 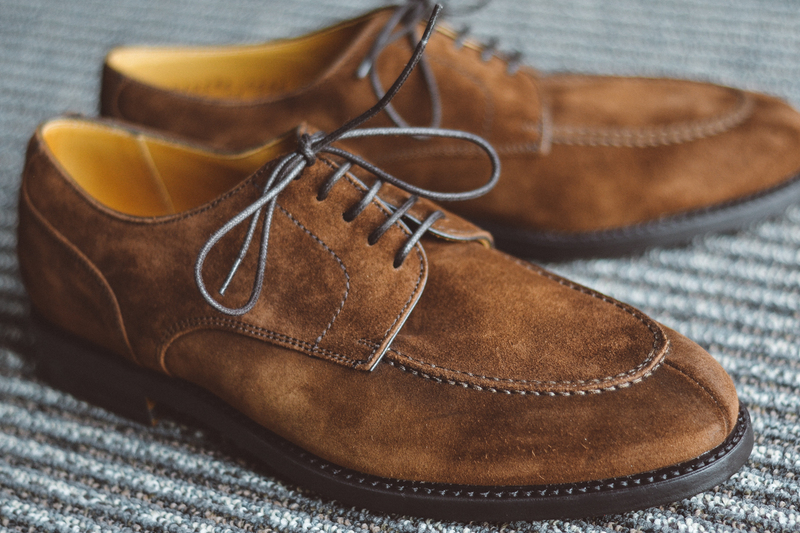 For some time I have had a brown suede Dover on my want list, and most recently I have been trying to find a reasonably priced, attractive substitute. It seemed like my only option was a split toe offered by Carlos Santos via Skoaktiebolaget as it had similar aesthetic features to the Dover but at a lower price point. 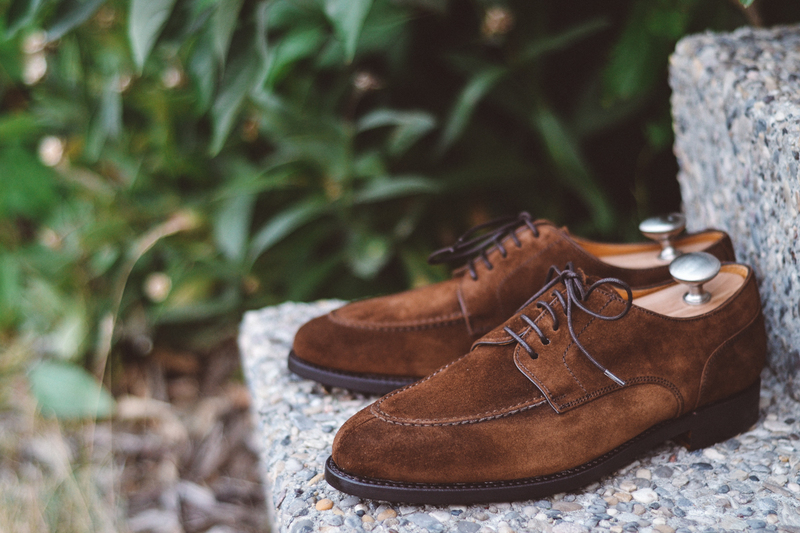 Season after season Skoak brought out grain and calf versions of the shoe, but never suede. I had somewhat given up on finding a pair and just continued to keep my eBay alerts on in case a suede Dover ever popped up in my size. While browsing Instagram I came across the picture below (via Leather Healer) of a pair of shoes I had never seen before by a brand called Berwick. I was instantly intrigued and direct messaged Wayne from Leather Healer to inquire about seeing some more pictures. Wayne sent me a bunch of photos, helped me figure out sizing and generously offered to send me a pair to check out in return for an honest review (the brand is also new to Wayne’s shop so he wanted some feedback). The Berwick’s came in a large shoe bag, wrapped in printed packing paper within a sturdy and well-designed shoe box. My overall first impression was very positive, considering that the presentation and packaging was more impressive than most high end footwear packaging I have seen (i.e. Alden). After first taking out the shoes I noticed the high quality suede, a beautiful brown with amazing color variation depending on how the suede was brushed. I had fully expected average suede due to the price point, so was pleasantly surprised at just how nice it was in person. 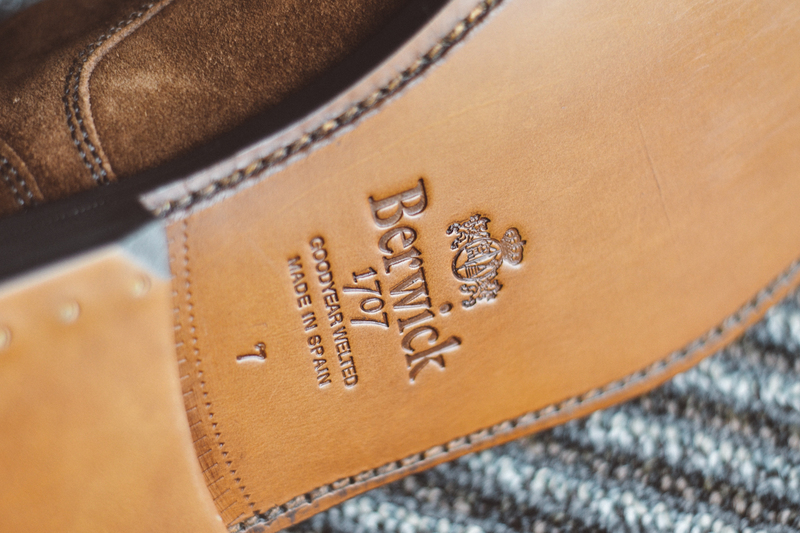 The stitching around the shoe was clean and the Berwick logo embossed on the leather soles added a polished look to the soles. After the first try on I did notice a couple minor flaws with the shoes. First, on one show the lace facings were slightly off from each other which made the laces look slightly crooked when bar laced. Second issue was that the split toe on one shoe was very slightly off center. I didn’t actually notice this in person, but a friend pointed it out after seeing a picture I had posted. Both of these flaws were very minor in my opinion and I would venture to say that most people would not pay attention to them. The shoes are quite light and comfortable to wear straight out of the box. I have worn them a few times and only noticed that the right heel is a little stiff by the end of the day. I fully suspect that this will soften after the shoes are broken in with some more wear. On arrival I chose to treat these with Obenauf’s Water Shield as it works well to protect against the elements. Be warned, the formula darkens the shoe as it soaks into the leather but once dry I found it returns to the original color. Tarrago Nano Protector – My standard go-to product for protection. 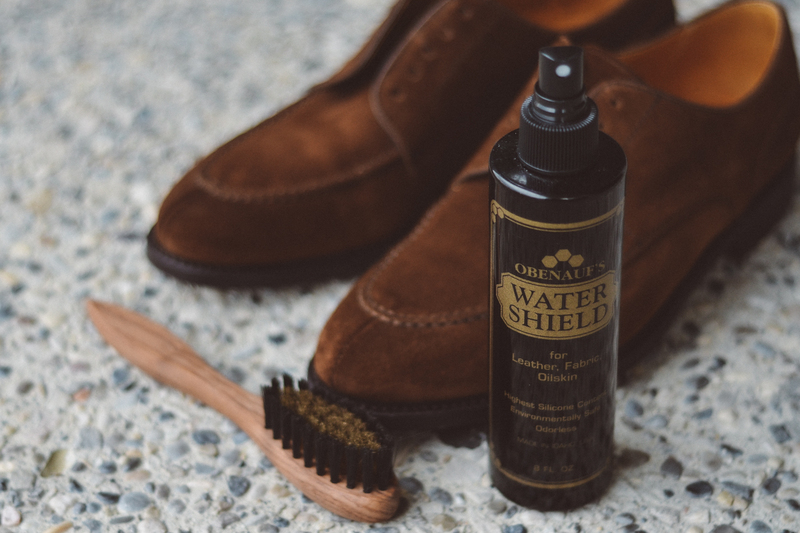 This stuff really creates a water resistant barrier for your suede shoes. Leffot even did a video pouring coffee on a pair of shoes after an application of this stuff. I recently ran out but will be picking up more soon. Saphir Omnidaim Suede Cleaner – I use this for seasonal cleaning of my suede shoes, I will likely do a write up on it at some point as it’s a great product. Saphir Renovateur for Suede and Nubuck – This can be used to condition your suede if it’s a bit dry or if you just want to restore the suedes color. The bottle linked is colorless and can be used on all suedes, however colored versions are also available. I am really impressed with the Berwick U-tip split toe as it checked off almost all the boxes in terms of what I was looking for in a suede split toe. The suede quality and shoe construction are impressive, particularly at the $320 USD price point. 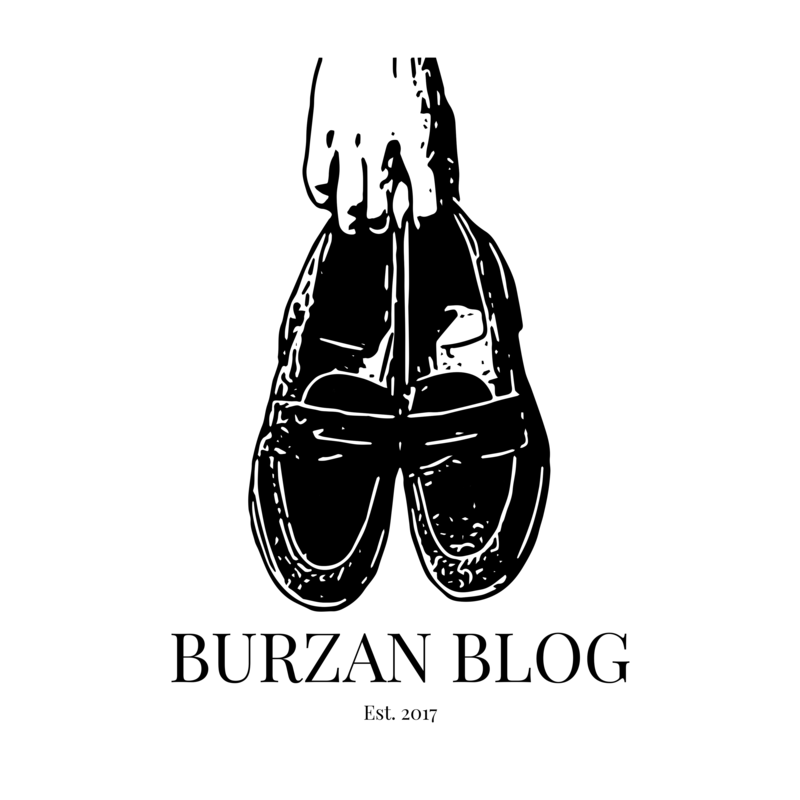 If you are like me and are looking for an alternative to the Dover, the Berwick split toe might just be the shoe for you.